Two French television reporters arrested in Venezuela on Wednesday have been freed, according to the country's ministry for foreign affairs. The Venezuelan government also released the three journalists working for the Spanish news agency EFE, said the agency itself. All of them will be deported to Colombia. The journalists were arrested in Caracas on Wednesday by members of the Bolivarian National Intelligence Service (Sebin). 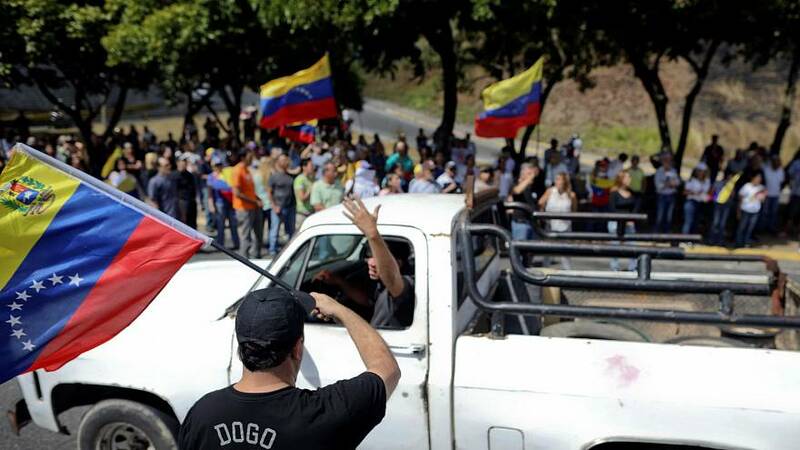 It is still unknown whether the driver, who has Venezuelan nationality, was also freed. The French reporters — named as Pierre Caillé and Baptiste des Monstiers — work for the "Quotidien" programme broadcast on the TV channel TMC. They were detained on Tuesday evening as they filmed the presidential palace in Caracas. Their producer in the country, Rolando Rodriquez, was also held, the main Venezuelan journalists' union the SNTP added. The Spanish branch of Reporters without borders confirmed the news on Twitter and said it was "following the situation very closely." The French foreign affairs ministry on Thursday, said Paris "demands the release" of the two French journalists arrested in Venezuela. It previously asked for the right to "consular protection" according to the Vienna convention and the right to visit. "Quotidien" tweeted that to say more risked aggravating the journalists' plight. The Spanish said in a statement on Thursday that it "wholeheartedly" rejected the arrests of the Spanish journalists in Caracas. "Through the Embassy in Caracas, all necessary steps are being taken to secure their release as soon as possible," it added. Two Colombian journalists, Mauren Barriga and Leonardo Muñoz and a Spanish journalist Gonzalo Domínguez were the ones detained. The three journalists are part of a team that travelled from Bogotá, Colombia to cover the crisis in Venezuela. The lack of accreditation by the Venezuelan government was Sebin's argument for arresting the journalists. EFE's Editorial Board demanded the immediate release of its "three comrades" in a tweet, adding: "There is no democracy without freedom of information." The SNTP also said that two television journalists from Chile, arrested on Tuesday night, had been expelled from the country. The Chilean foreign minister Roberto Ampuero accused Venezuela of trampling on press freedom. Venezuela's foreign minister Jorge Areaza has blamed foreign journalists for entering the country without having secured work permits. The organisation Reporters Without Borders has denounced "violence by security forces against journalists" from Venezuela and abroad. It comes as the US envoy to Venezuela, Elliott Abrams has cautioned socialist President Nicolas Maduro for acting against the self-proclaimed interim president Juan Guaidó. Abrams said the US will keep the pressure on Maduro to step down by applying further sanctions and search globally for assets. "The security of interim president Guaidó is a concern," Abrams told a group of reporters.